Barielle has released two Fall 2013 Collections. This one is Sophisticated Lady. There are some amazing colors in this collection. From bright and bold to vampy and sultry - there is sure to be a color to suit every fashion conscious lady. It's hard to believe the summer is fading away and a new season will be here soon. But Barielle knows how to ring in a new season. These colors are scrumptious. The formula of these polishes is typical of Barielle standards. Two coats provide opacity and it dries to a high gloss finish. Dinner at 8 - is a classic red and is bright and bold. This is definitely a power red. Edgy - is a vampy eggplant shade. This shade will be be the perfect complement to sweaters and boots. In Good Taste -is a gorgeous, rich shade of brown. I adore this chocolatey shade. London High Tea - is a glorious rosy polish with subtle shimmer and shine. This one is a must for anyone who likes warm rosy tones. 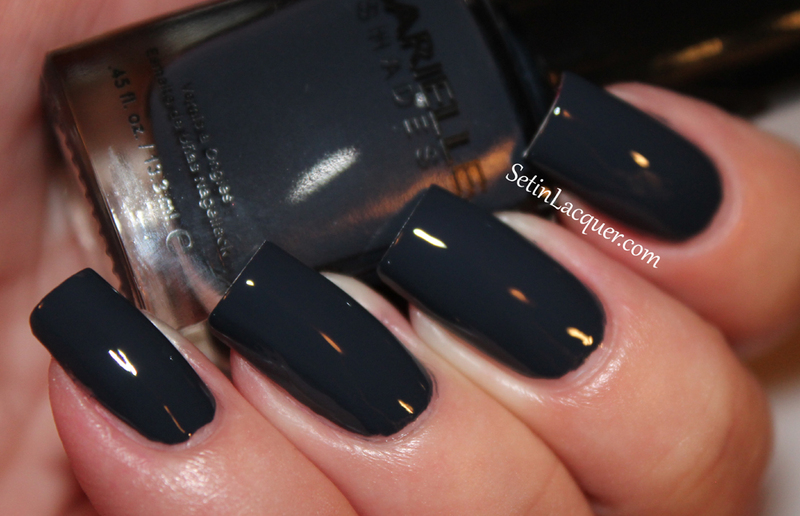 Tres Chic -is a gorgeous deep dusty blue. I love these rich blue colors. This collection will be available on Barielle.com on September 1, 2013 for $25 for the set or $8 per polish. Make sure to follow Barielle on Facebook to keep up to date on new releases and promotions. Glam Polish - Jem and Lost Your Marbles swatches and review. I have a new-to-me polish to share with you today - Glam Polish! Glam Polish is an Australian made Indie polish that is big three free. Their polishes range from topcoats to glitters. These polishes are very pretty and the formula was great. Let me just jump right in and show you. Lost Your Marbles - is a mix of silver holo dots with silver holo micro glitter in a clear base that looks like a galaxy on your nails. The glitter was easy to apply and laid smoothly on my nails. It didn't require any fishing for glitter. Just make sure to give it a good shake before you start. 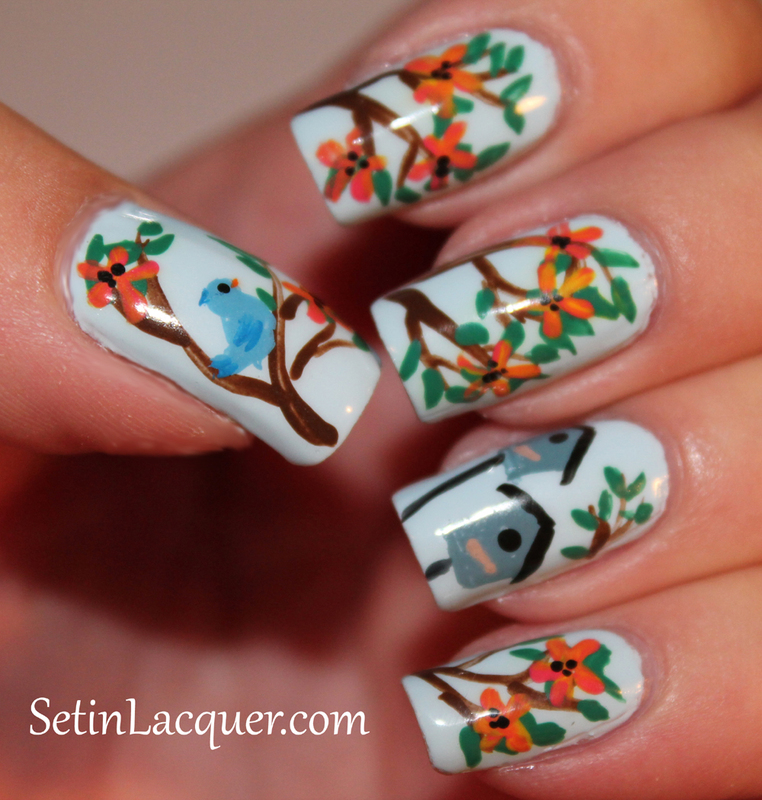 It is shown here over Seche Clever and Confident. Jem - has blue, purple, light pink and holographic silver microglitter in a gorgeous pink base. 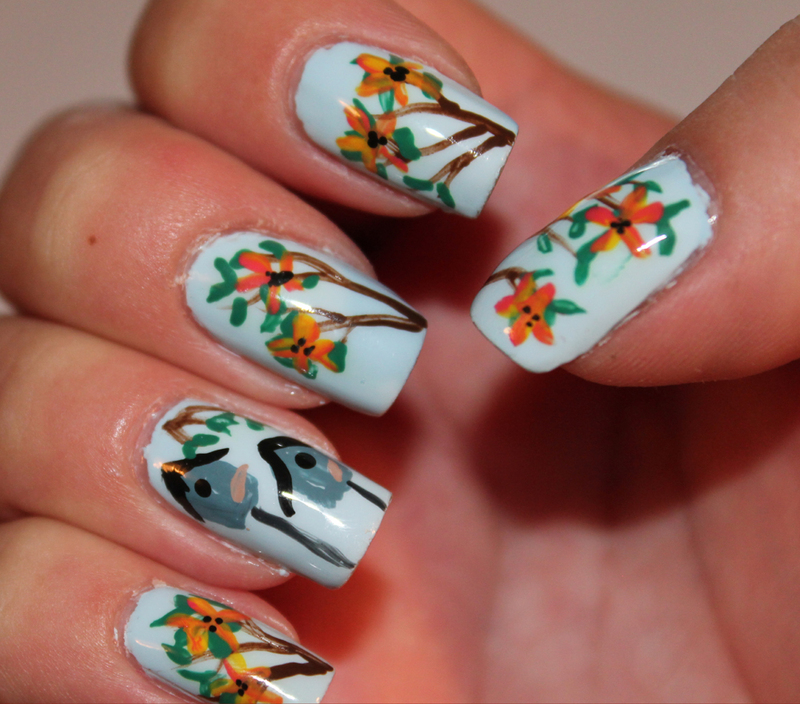 It's definitely a party on your nails. This is two coats. Glam polishes are available from Color4Nails.com for $12.50. Make sure to follow Color4Nails Facebook page to keep up with the latest collections and releases. Color4Nails carries hard to find Indie and mainstream polishes. I have a different kind of post for you today. I recently received a subscription box from Wantable to share with you. 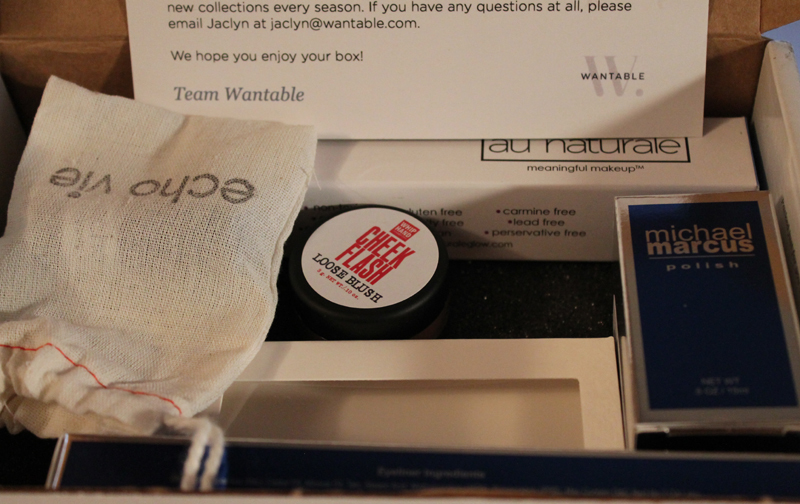 Wantable is a subscription box. I know what you are saying... another one? This one is slightly unique in the fact that it provides you full size products - not samples. "Each month our in-house and guest curators hand-pick beauty and fashion jewelry products from hundreds of quality boutique, specialty, and premium vendors to find the best on-trend items. Then we use each customer’s unique profile and purchase history to select the perfect set of products just for them. How do we do it? Some say magic, and it certainly seems that way. We say it’s a combination of talented curators and cool technology. Our customers are unique, so no two boxes are ever the same." - Wantable website. Each beauty box is valued at $80 or more, and the subscription costs $36 per month, or you can purchase a single box for $40.They have recently launched a fashion jewelry box also. It works the same way - five to seven items with a total value of more than $80 and a cost of $40. Lets move on to the actual items. Let me explain to you that while I love make up - I am not a make up artist. Okay. Here goes. Here's the box I received. I was excited to look at all the goodies! Let's start with my favorite item - nail polish! 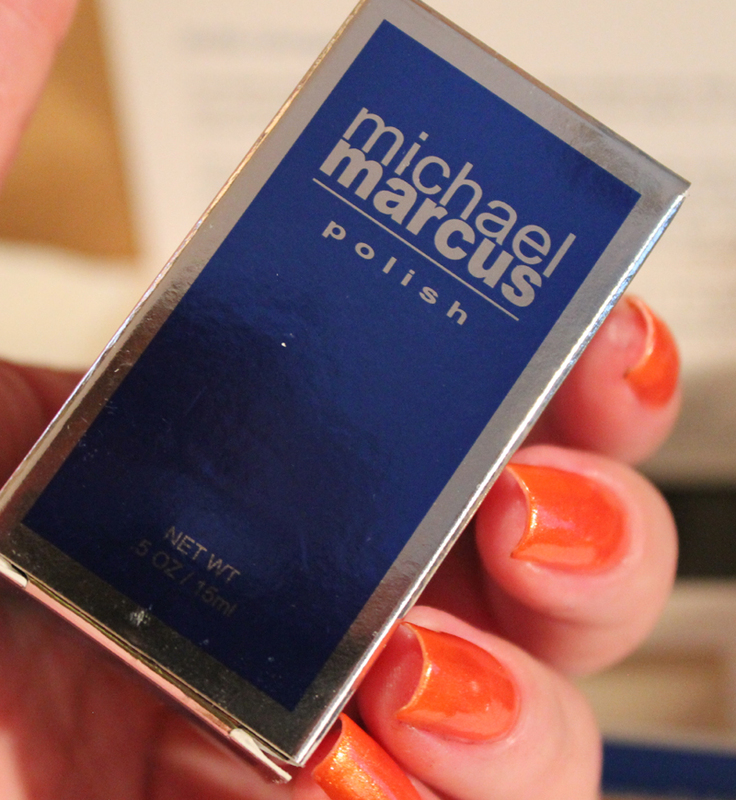 This is a Michael Marcus polish called Sunset. 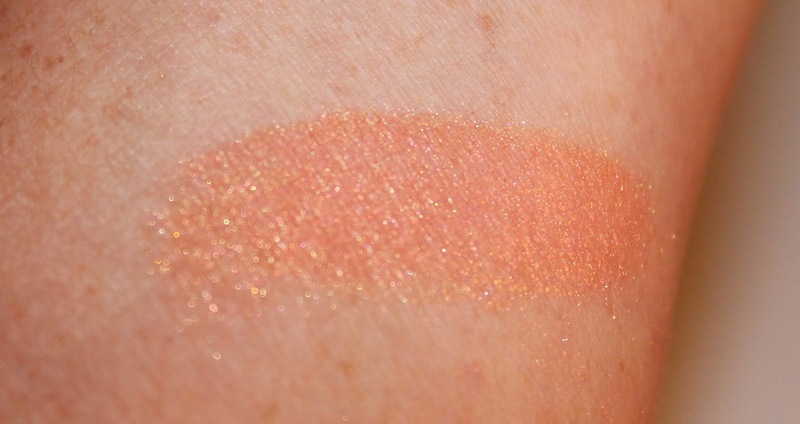 It is a gorgeous orange color with shimmer and shine. The formula was great! It is valued at $15. 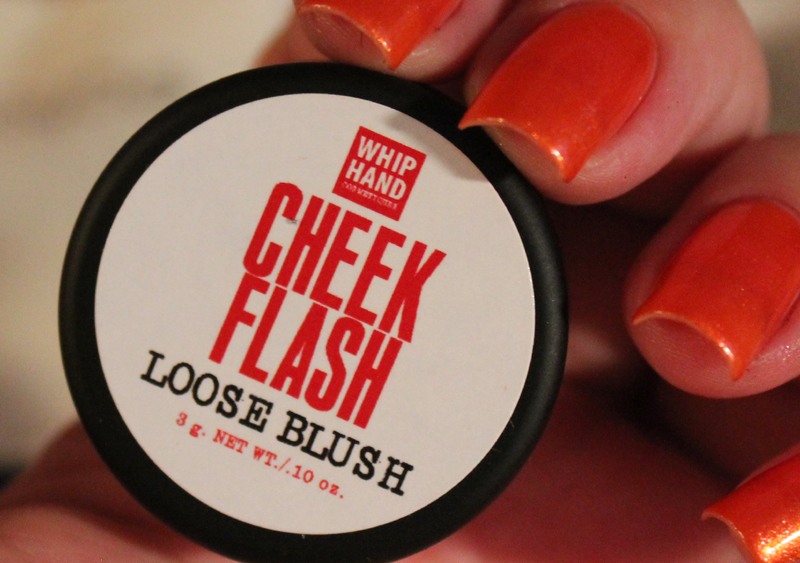 Next up is a gorgeous loose powder blush called Cheek Flash "Wanting." It is valued at $18. The powder applies smoothly. 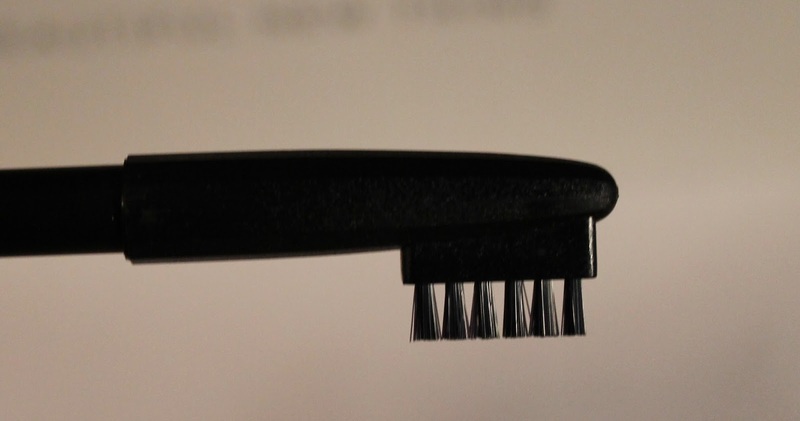 There was also an amazing Travel Eye Smudger Brush by Japonesque. The brush is firm, yet soft and silky. It is valued at $14.50. 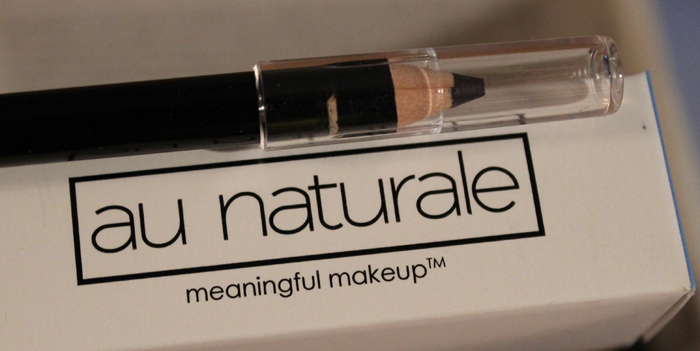 I also received a great eye liner pencil from Au Naturale Cosmetics valued at $18.I liked the way the liner applied. But I usually prefer ones that I don't have to sharpen. There was also a great Brunette Brow Pencil from Michael Marcus valued at $24. 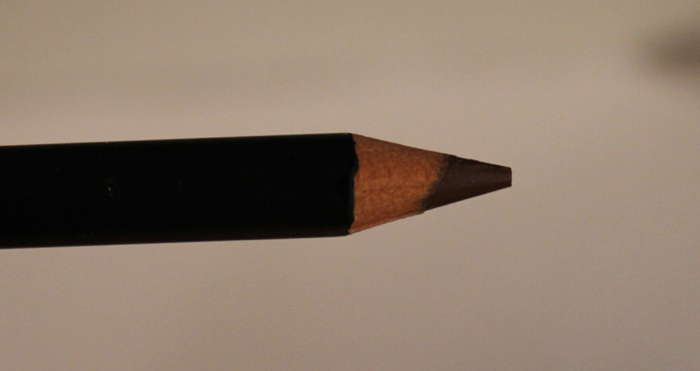 My brows are extremely thin so a brow pencil is an item I will use a lot. There was also sample of body oil by Echo Vie. That's a total value of $89.50. I say it's definitely a good deal. You get to personalize your likes and dislikes. So for example if you don't want lash products you can specify that in your profile. I may have to try the fashion jewelry box next! This subscription box was sent to me for an honest review. All opinions are my own. Please note computer monitors may vary in color display. I wasn't sure whether to post this or not since it isn't available for purchase anymore. But once I put it on my nails - I knew I had to share it. What Happens In Vegas... Ends Up On Facebook is a dusty eggplant shimmer with holo qualities and blue/purple colour shifting iridescent micro glitters, pink micro glitters and red micro shimmer. This show exclusive shade was created for bloggers who visited the 2013 Cosmoprof North America trade show at Mandalay Bay in Vegas July 14-16, and was available in limited quantities at Girly Bits Cosmetics on Monday, July 29th. Only one batch was made, and each bottle was numbered. I love Girly Bits polishes. She makes an amazing scattered holo polish. And many of you may realize that I am a sucker for anything holo. Let me just move on to the swatches. If you like this polish make sure to follow her on Facebook and grab those limited edition polishes while you can. They sell out oh-so-fast. 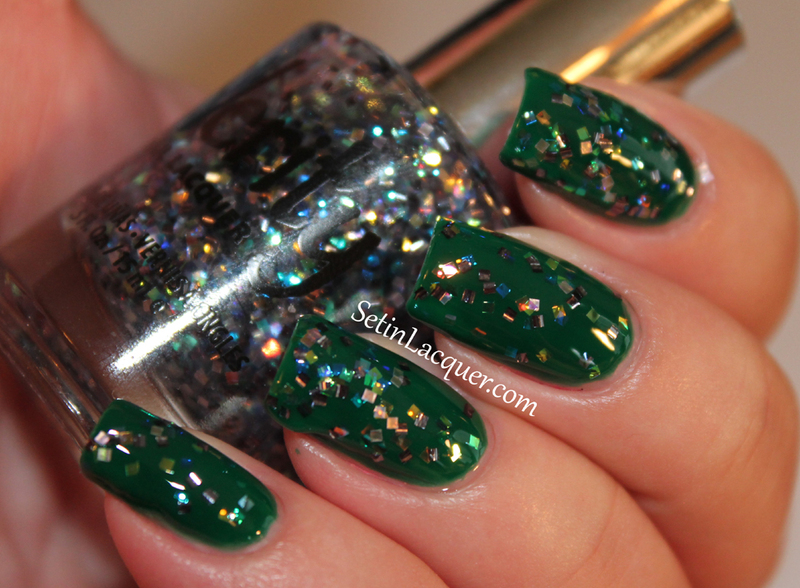 I have some more Verity Nail Lacquer to share with you today. I recently tried some of Verity's other polishes. You can see that post here. These polishes have a nice formula. They apply nicely and dry relatively quickly. I do think they could have been a little more original with the names. But I can deal with that as long as the polish is as great as it is. They apply wonderfully and are not streaky. Aqua Blue - okay, it's not blue and it's not aqua. It's a gorgeous Kelly Green. This cream polish is gorgeous and dries to a high gloss shine. This is two coats. 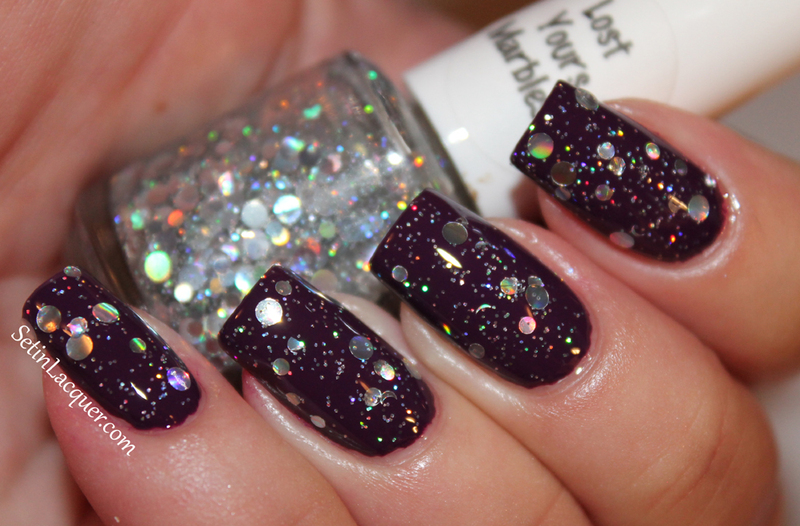 Celebrity - has hex holographic glitter mixed with small round silver glitter in clear base. It is shown here over Blue Navy. The glitter applies evenly and easily. Movie Stars - has deep pink/light red and blue metallic hex glitter mixed with small silver micro glitter in clear base. You do need to shake this one often. But other than that it applies easily. Twinkle Squares - has square dark silver glitter with iridescent blue/multi colored glitter in clear base. It applies easily and evenly. 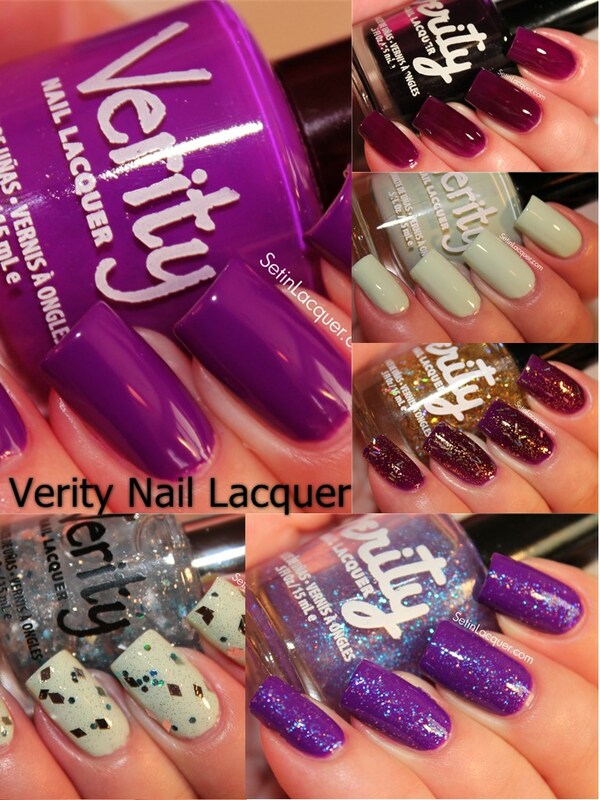 Verity Nail Lacquer can be purchased online at The Beauty Clutch for $3.99 to $4.95. The Beauty Clutch offers nail polish, nail treatments, spa bath and body products, hand and foot care, and accessories. Follow The Beauty Clutch on Facebook to keep up with new collections, current releases, restocks and new polishes. The Beauty Clutch ships to physical addresses and PO Boxes within the Continental United States and Alaska, Hawaii, Puerto Rico, Virgin Islands, AS and MP. Shipping outside the USA is not available. Time is flying by. It is hard to believe the summer is almost over and we will be changing our manis from Summer looks to Fall. I don't always do the Weekly Herd as it seems the weekends are completely too short. So this one will cover about ten days. It has been a busy, busy week! Next week will too. Look for reviews on Verity Nail Lacquer, Glam Polish, the Barielle Fall Collections, China Glaze Fall Collections and the new Seche colors! 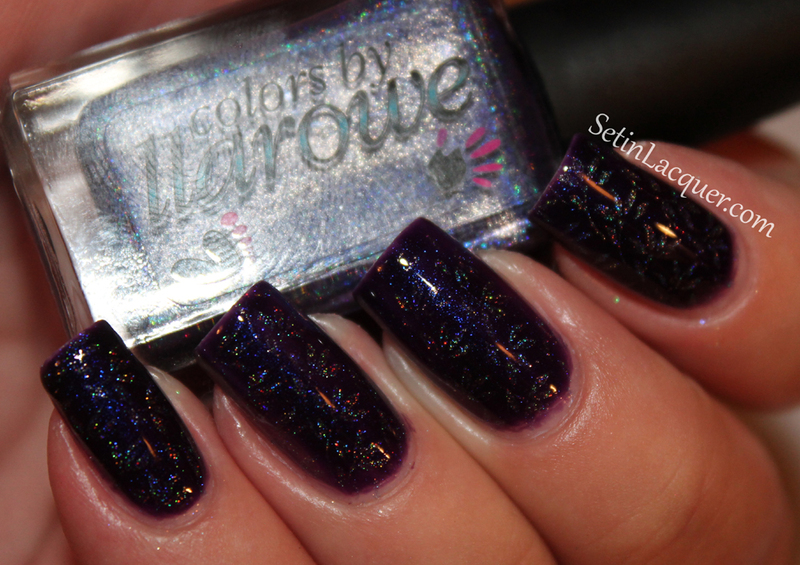 I have already shared these gorgeous Colors by llarowe polishes with you - individually that is. Today I would like to show you how well they work together. First let me tell you that you can preorder the Colors by llarowe polishes today until 5 p.m. mdt! I decided to pull my stamping tools out. I haven't stamped in quite a while and was just talking to a blogger friend about stamping. Colors by llarowe Purple Rain, Smooth Criminal and the FabUrNails Fun 5 stamp were used to create this stamped look. I just wish the camera would have picked up the design better. The holo in Smooth Criminal seemed to outshine the design. But the polish worked wonderfully stamped. Let me quit rambling and show you. These polishes and the stamping plate can be purchased at Llarowe. But the polishes sell out fast. If you want one of these polishes watch for a launch by following her Facebook page. Or you can preorder the CbL polishes today, August 24. I had a nail art idea and had to follow through with it. I wasn't sure I could pull it off. But I think I did. 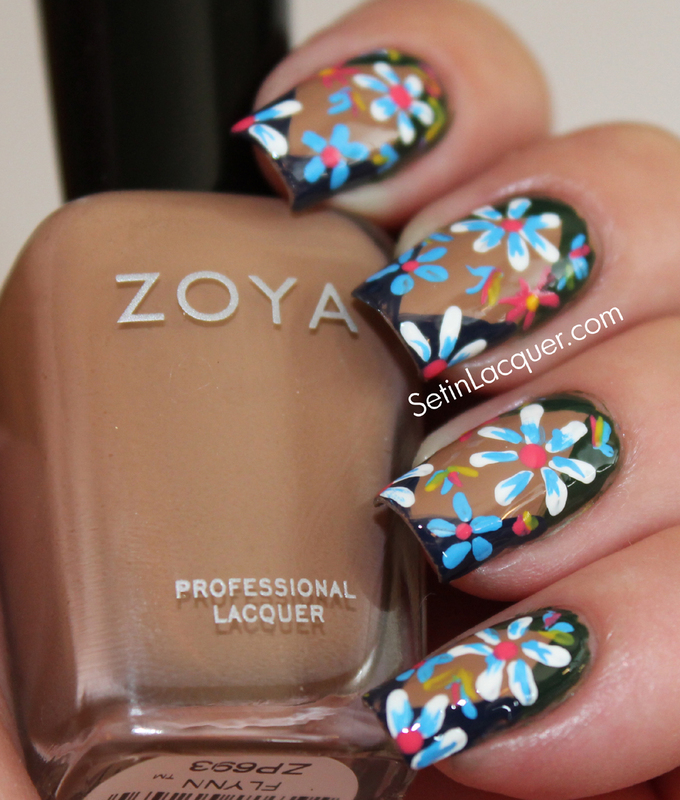 I used Zoya Blu for a base color and acrylic paint for the scenery. 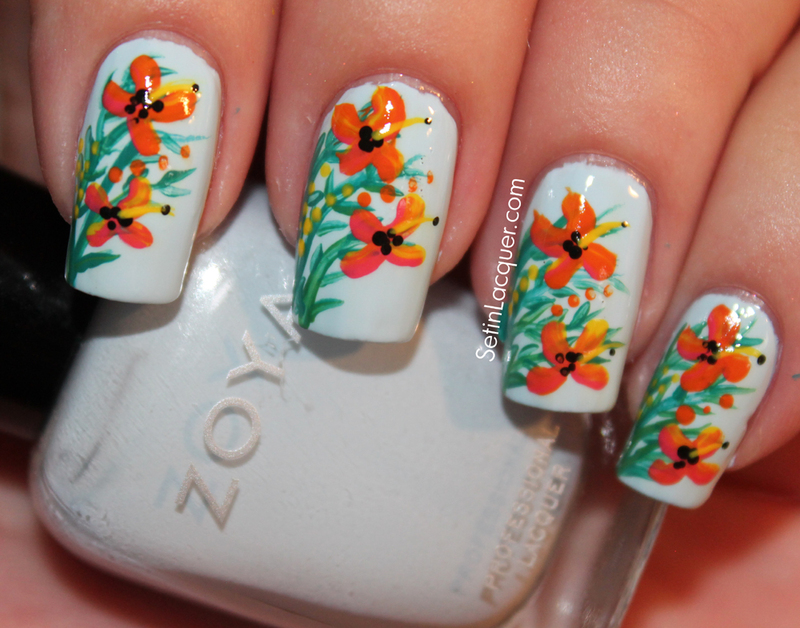 I don't think of the nail art idea as a whole concept when I am doing it. I think "in shapes." Brown lines created with a striping brush served as the background of the tree. Then I added some leaves and flowers to the trees. The bird houses were easy as they were just a square with a triangle on top. Finish it off with a black roof, entry hole and the perch. The bird was just a few strokes of blue paint in the general shape of a bird and then some thin lines for detail and depth. A quick dot for the eye and a orange beak and all was complete. I did the right hand too. But the bird flew away. 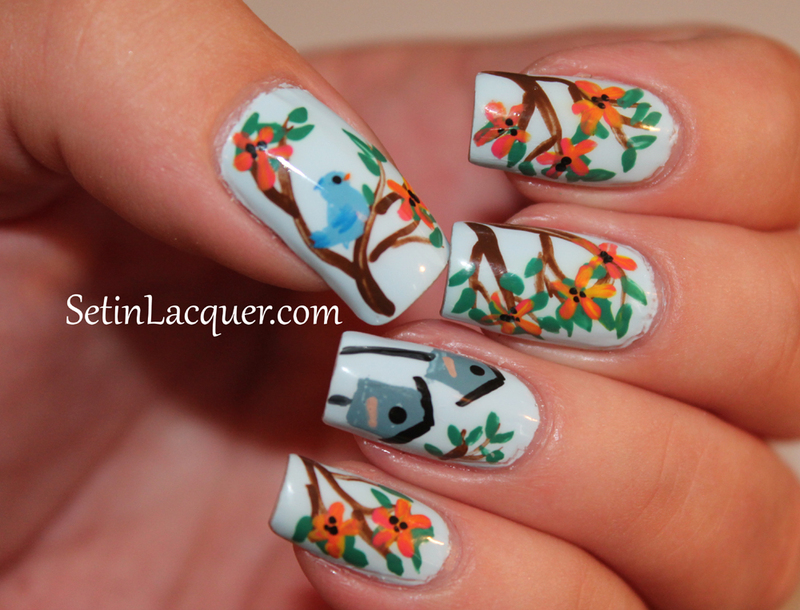 I will have a similar nail art idea in a tutorial available soon. Hot Days, Hotter Nights Giveaway!